On Thursday, November 9, 2017, during the early morning hours, a multiple cat burglaries occurred in the 71300 block of Country Club Drive in the city of Rancho Mirage. The suspect entered an unlocked door to multiple residences and stole property while the victims were asleep inside. During the months of November and early December several other cat burglaries occurred within the city of Rancho Mirage. 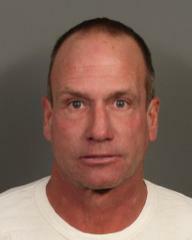 The Burglary Suppression Unit (BSU) assumed the investigation and identified Steven Edward Cain, age 51 of Rancho Mirage, as the suspect. On Monday, December 18, 2017, at approximately, 1:30 PM, BSU members located Cain in the 39500 block of Berkey Drive, Palm Desert. Several items stolen in the cat burglaries were recovered in addition to a stolen firearm from a previous burglary. Cain was implicated in multiple burglaries as well as multiple identity thefts. Cain was booked into the Riverside County Jail, located in the city of Indio for first degree burglary, fraud, identity theft, possession of stolen property, ex-felon in possession of a stolen firearm, and violation of probation. Anyone with information regarding this incident is encouraged to call Deputy Jones at the Palm Desert Sheriff’s Station at (760) 836-1623.